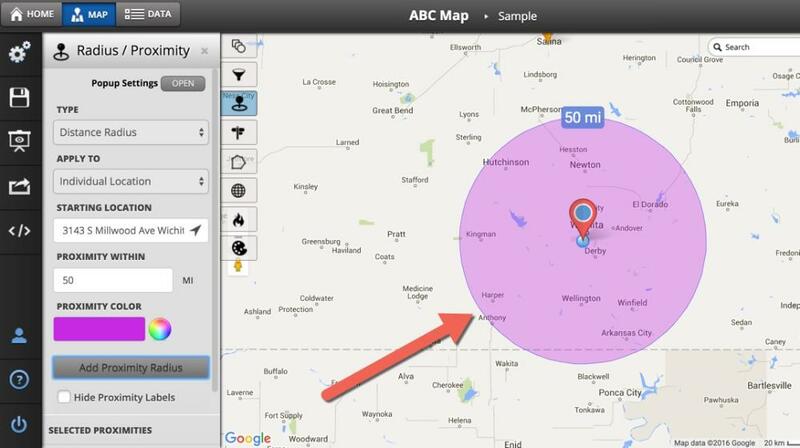 Maptive’s Distance Radius / Drive Time Polygon Tool allows you to draw a radius circle in miles or kilometers from any location, whether on your map or an address you enter into the tool, in order to quickly determine distances between your center point and any markers that fall within the radius. 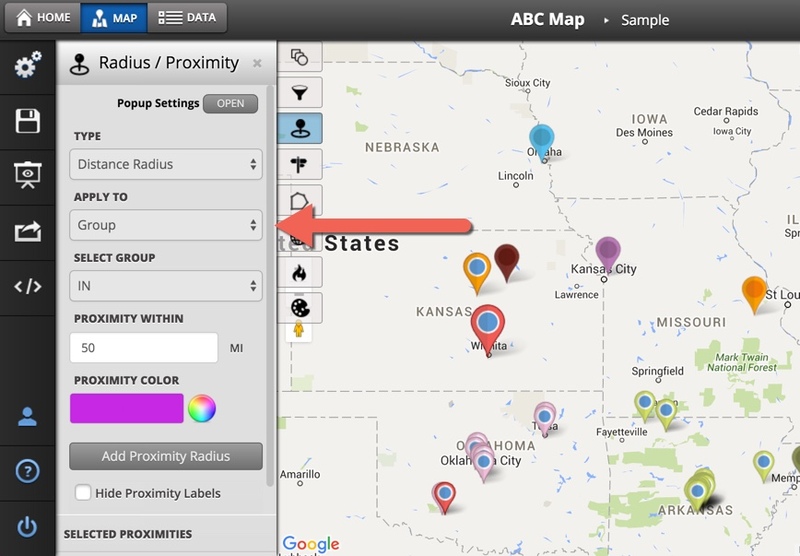 You are able to add as many radii to your map as you need; export from each radius individually or all at once; edit the name, color and opacity of each radius or radius group and customize the radius popup bubble. 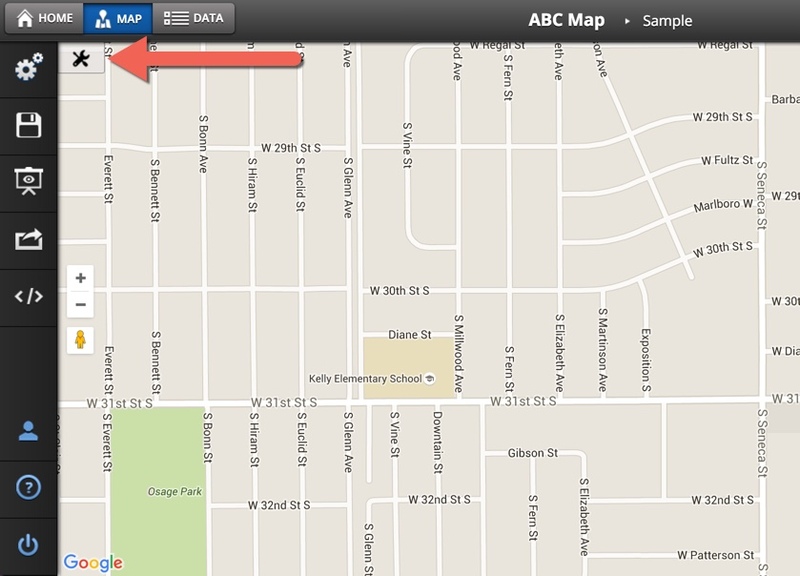 Step 1: Click to open the map you want to edit from the list that appears in your account home screen. Step 2: Open Map Tools. Step 3: Open the Distance Radius / Drive Time Polygon Tool. Step 4: Pick your starting location. To do this, find an existing point on your map, click on it so that the map marker popup appears, then find and click the "Draw Radius" option. You'll see the address populate into the Starting Address box. 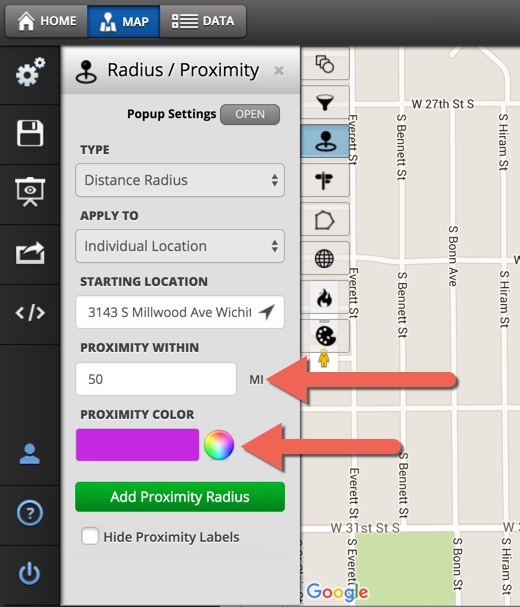 Step 5: Choose your proximity distance and color from the tool window. Step 1: Switch from Individual Location to Group. 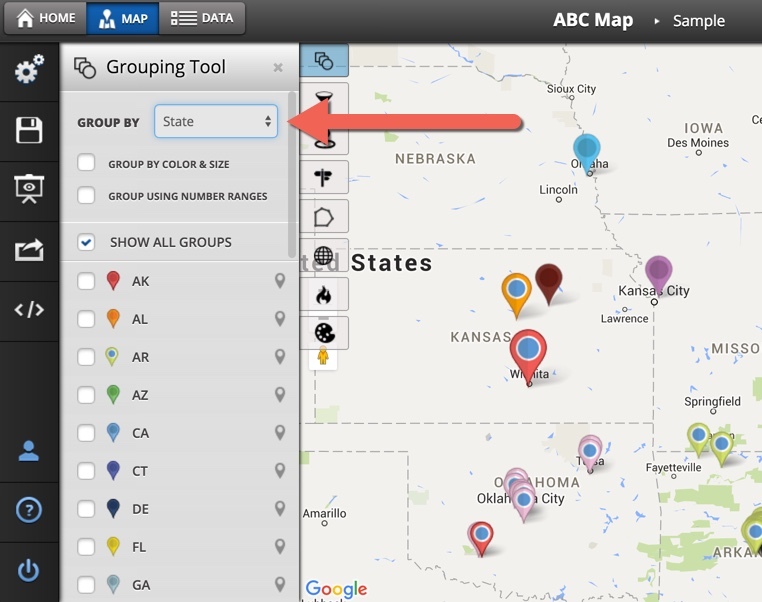 Step 3: Select your group and add your proximity radius. 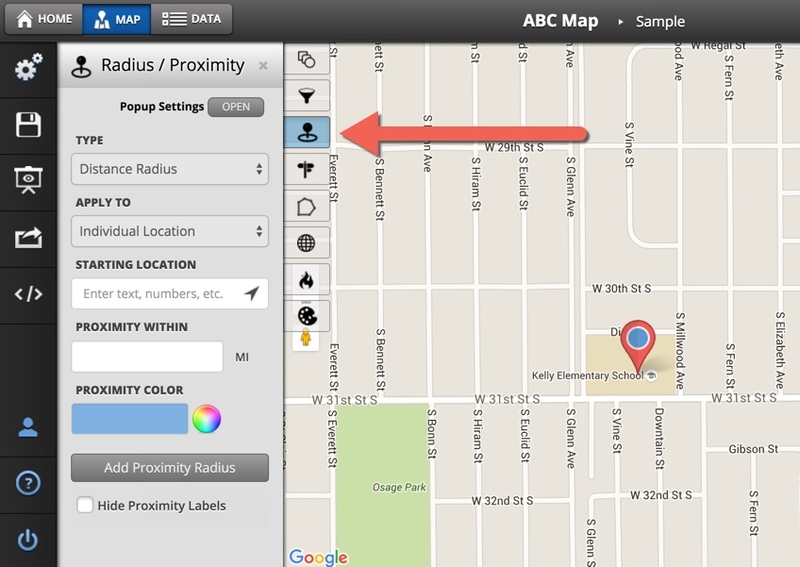 Your new radius circles will appear for the locations within your group. You can drag your radius to a new location. Step 1: Set the radius on your map. Step 2: Double click the center point of the radius. Step 3: Click anywhere in the radius and drag it to the new spot. 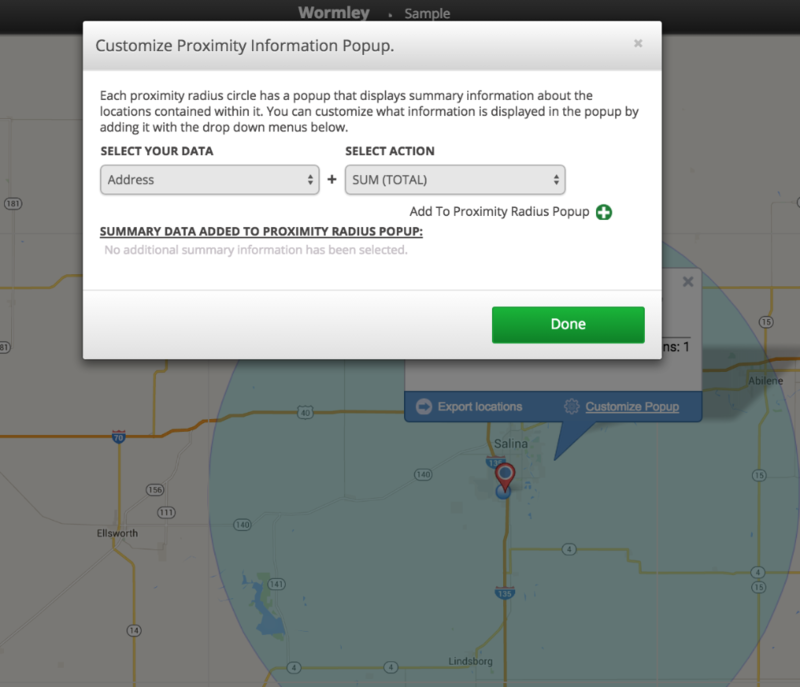 Step 4: Once you have the radius where you want it, click the green check box at the top to save. Click the red x and the radius will go back to where it started. You can export all your radii data at once. 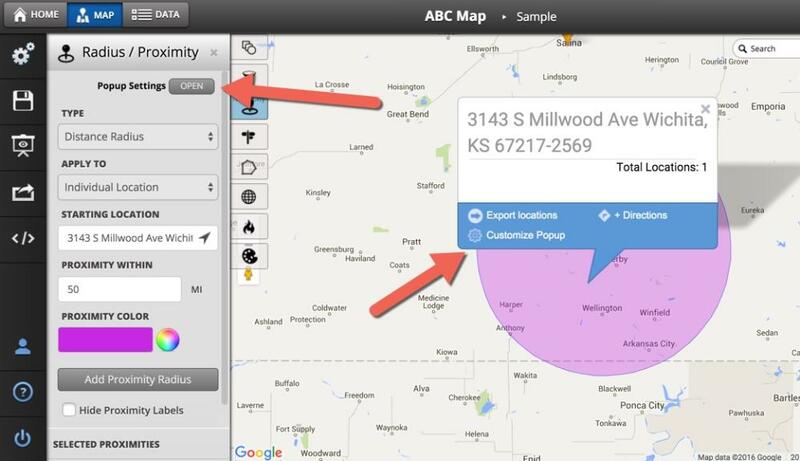 Step 1: Set up your radii on your map. 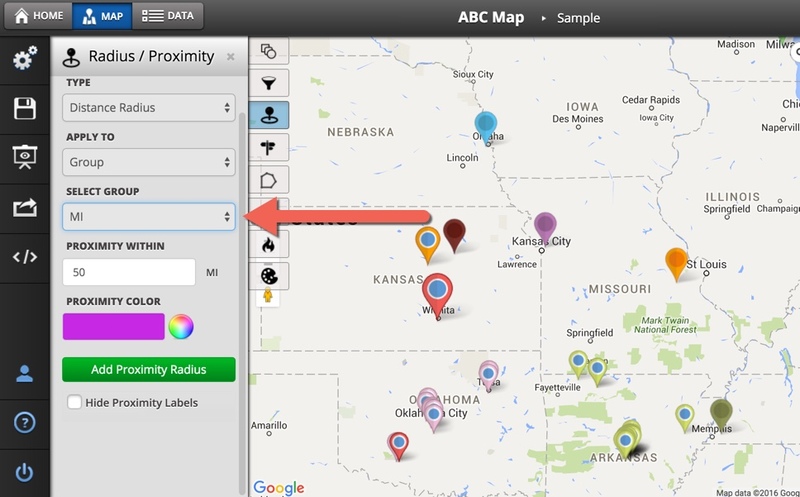 Step 2: You'll see a green button at the bottom of your Radius/Proximity Tool that says Export to File. From here you can export all of the data from within all of your radii at once. The export will include a column indicating from which radius the data came as well as a column for distance to center. 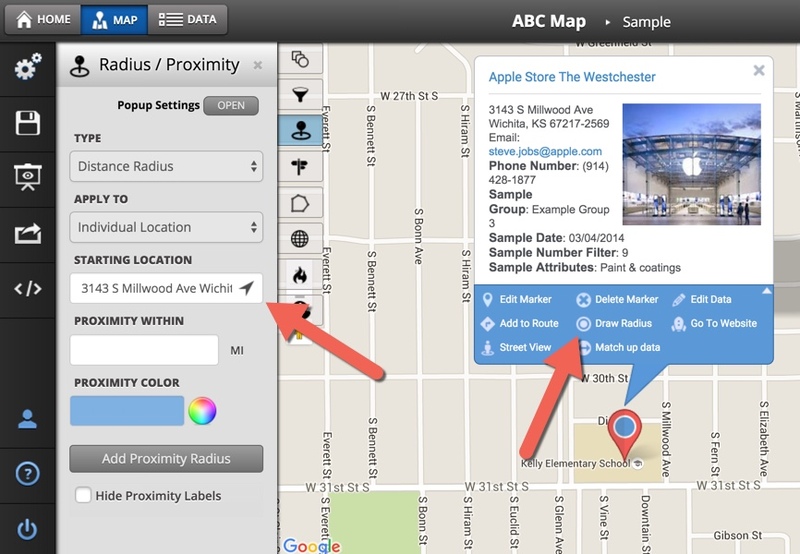 You can edit the name, color and opacity of your radius. Step 1: Set your radius on your map. Step 2: Click on the pencil on the listed radius in the Radius/Proximity Tool. Step 3: Clicking the pencil will open the editor where you can change the name, color and opacity of this radius. Step 4: Click save to see your changes.